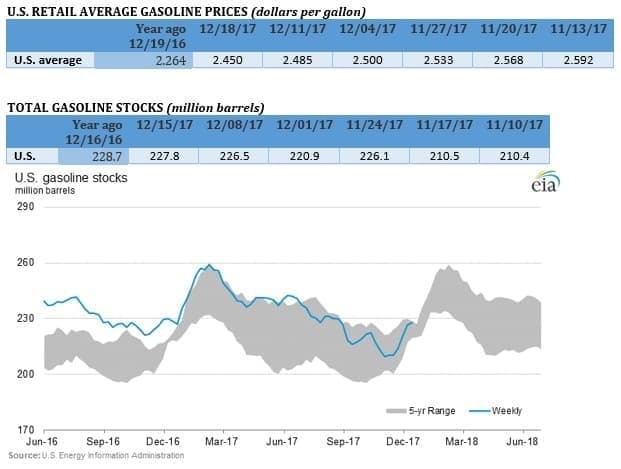 The oil market has remained relatively quiet ahead of the holidays, despite the EIA suggesting increased production in the U.S.
Oil prices were flat amid light trading at the end of the week after strong gains on Thursday. 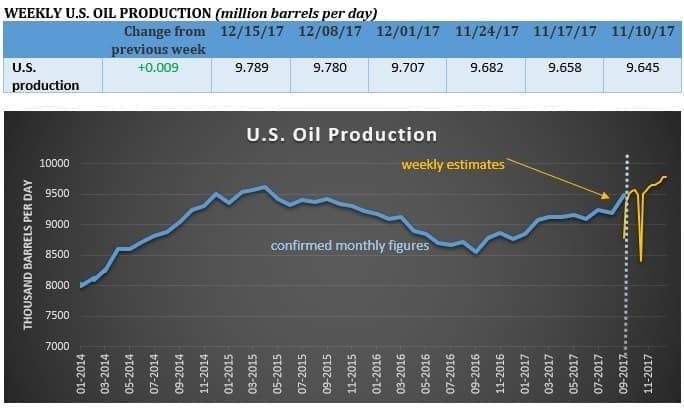 The EIA reported some mixed figures – more strong oil production gains from the U.S., but also a sizable drawdown in crude inventories. The approaching holidays has the market subdued. 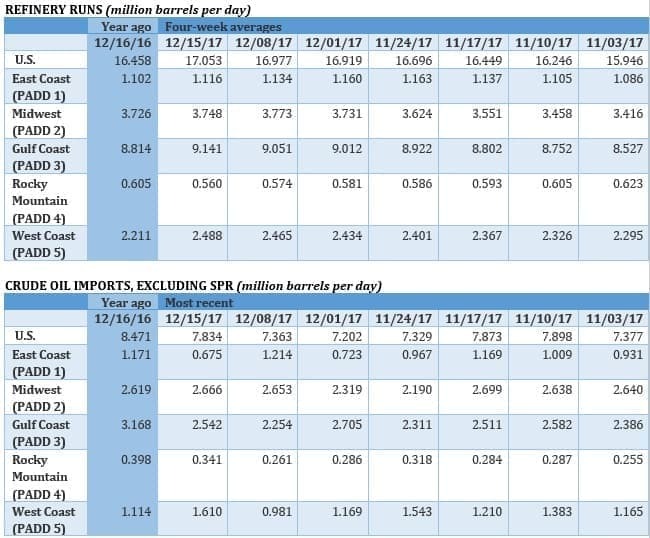 Saudi oil minister: Market will rebalance in 2H2018. Saudi oil minister Khalid al-Falih told Reuters that the inventory surplus will be eliminated in the second half of 2018, and the earliest date to reassess the market will be at the OPEC meeting in June. 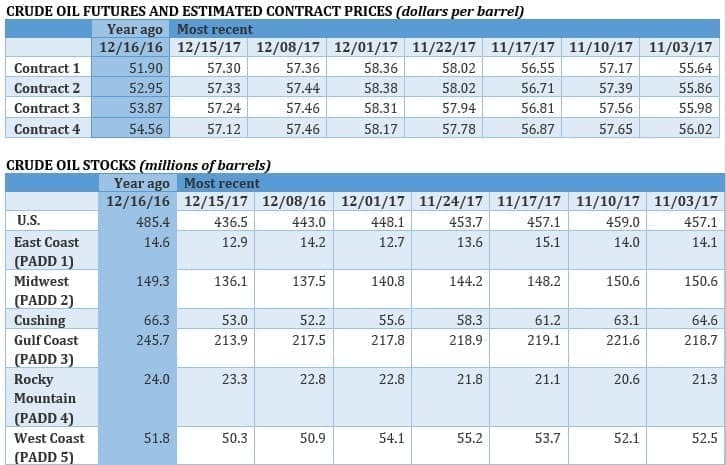 And while the IEA has forecasted strong supply growth next year from U.S. shale, al-Falih says demand will help drive the market towards rebalancing. “[T]he untold story is demand. Demand has been extremely healthy in the last couple of years. 2017 will prove to be a very robust year in terms of demand and we expect that momentum to continue,” al-Falih said. Separately, Reuters reported that OPEC has quietly started working on an exit strategy behind the scenes, and the group will reportedly consider several options. “It’s a continuity strategy, rather than exit,” one of the OPEC sources told Reuters. Ineos: Forties pipeline will restart in early January. The operator of the Forties pipeline system, Ineos, said that the pipeline will be repaired by Christmas and will restart operations by January. “Based on current estimates the company expects to bring the pipeline progressively back to normal rates early in the new year,” Ineos said. Related: What Will Drive The Next Oil Price Crash? BP CEO not worried about shale threat. BP (NYSE: BP) CEO Bob Dudley told the FT that he isn’t worried about shale threatening conventional oil producers in the long-term. He argued that shale won’t be able to grow forever, so the threat to permanently low oil prices is not as big as most people think. “There are cracks appearing in the model of the Permian being one single, perfect oilfield,” he said. Over the long run, that could diminish shale’s importance. “I don’t think [U.S. shale] will be the perfect swing producer now,” Dudley said in an FT interview. “For a while, I was worried. 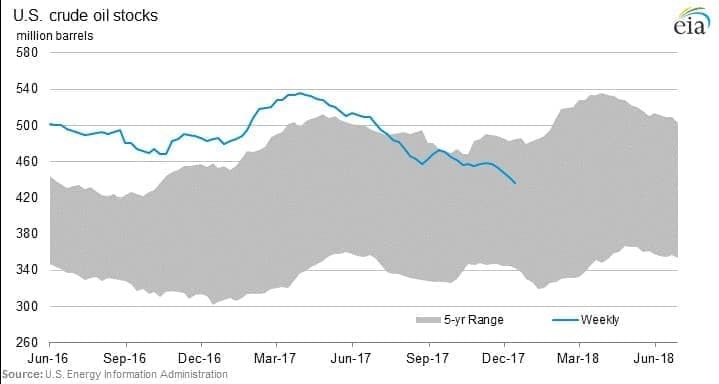 But I think it is going to be less solid.” An estimate from Wood Mackenzie finds that shale growth will face problems in the 2020s after the sweetest spots are picked over. BP has dabbled in shale drilling, but is overwhelmingly concentrated in conventional oil fields. Saudi Aramco hunts for U.S. shale. In a sign of the times, Saudi Aramco is reportedly looking to make an acquisition in the U.S., perhaps for shale assets. The WSJ reports that Aramco is exploring the purchase of a stake in Tellurian Inc., an LNG exporter. Aramco has also reportedly inquired about shale assets in the Permian and Eagle Ford, although such discussions are preliminary. Analysts speculate that the move could help Saudi Arabia better understand the U.S. shale business. Arctic National Wildlife Refuge opens as part of tax bill. The decades-old fight over ANWR came to a rapid conclusion this week, as a provision tucked into the Republican tax bill opens up ANWR for two lease sales. Area 1002 of ANWR is thought to hold between 5.7 and 16 billion barrels of oil equivalent, but that assessment dates back to 1998. The uncertainty over the resources, combined with the fact that development could be costly, could deter investment. Additionally, there is still political uncertainty – the first lease sale is years away and could be vulnerable to reversal by a future administration in Washington. Eni starts gas production at Zohr. Eni (NYSE: E) started up natural gas production at the Zohr field in offshore Egypt, a little more than two years after the initial discovery. The rapid turnaround arguably sets a new standard for such large-scale projects, and Eni’s CEO Claudio Descalzi trumpeted his company’s approach. The industry should shift its focus “from outsourcing to in-sourcing,” Descalzi said, according to Bloomberg. "Things should move in parallel, of course this implies more risk, but it’s mitigated by in-house expertise, and this leads to a lower overall cost.” Zohr is critical to Egypt as well as Eni. Meanwhile, in the same week, Descalzi found out that he will stand trial along with other top officials at Eni and Royal Dutch Shell (NYSE: RDS.A) over an alleged bribery scheme in Nigeria. PDVSA in talks with Trafigura for oil swap. Reuters reports that Venezuela’s PDVSA is in talks with oil trader Trafigura over a deal that would swap 10 percent of PDVSA’s oil output for imported refined fuel. The talks are taking place because Venezuela is out of money and cannot access credit due to U.S. sanctions, which means it needs to rely on bartered deals.